This is a massive 42mm. solid 18k. 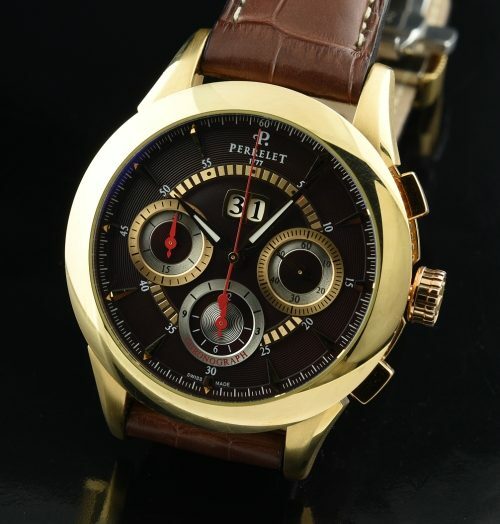 gold PERRELET modern watch measuring a thick 14.5mm. including the sapbhire crystal. This watch displays close to “like new” condition and includes the original band, gold plated and steel buckle, box and papers, dating to its 2013 purchase. I really like the ribbed sides of the case. I also appreciate the look of the brown-toned dial which melds perfectly with the lustrous gold. The very fine PERRELET automatic winding movement is operating perfectly as it should and is finely detailed and visible from the sapphire case back. This particular model with this dial is hard to find. Perrelet watch company has been operating since 1729. This watch commands attention on the wrist. Priced very well at $6900.